Tanauan City, Batangas — March 29, 2019 — Ride to your own BeAT with the New Honda BeAT, which now comes with three new stripes design in nine exciting colors making a perfect ride for the young, fun, and hip generation. The New Honda BeAT comes with Combi-Brake System (CBS) that helps balance the front and rear wheel braking optimally, allowing ease of operation. It also has an Idling Stop System (ISS), a technology that Honda originates which automatically turns off the engine after three seconds of being stationary and automatically turns on again once the throttle is twisted. This prevents fuel wastage and delivers the most enhanced, fuel-efficiency of up to 63 km/liter, so you can ride longer on the road. Equipped with Programmed Fuel Injection or PGM-Fi, a fuel supply system which is capable of supplying the perfect amount of fuel and air, the New Honda BeAT gives efficient engine power with low emission. The hip scooter also has the following product features such as, ACG Starter System, CVT (Continuous Variable Transmission with V-Belt), secured Key Shutter, Enhanced Smart Power (eSP), Tubeless Tires, Park Brake Lock, and Side Stand switch. For a comfortable and easy ride, the New Honda BeAT is engineered with a wider step floor, convenient 11-liter utility box, and Informative Semi-Digital Meter Panel with Eco-Indicator. In addition, its bigger headlight design is equipped with Automatic Headlight On (AHO) with multi-reflector for wider illumination, and an over-all modern and stylish look. 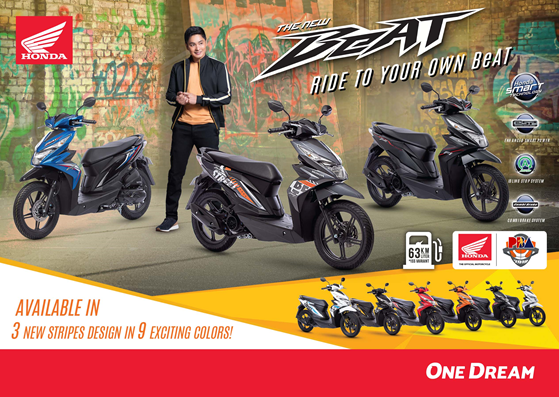 With this, the New Honda BeAT makes a scooter fashionable and functional that is perfect for the young and hip generation. For more information, visit their official website – www.hondaph.com or follow them on Facebook – www.facebook.com/hondaph/.